Oh, I say, old bean! Pip pip, cheerio, and all that, what what? 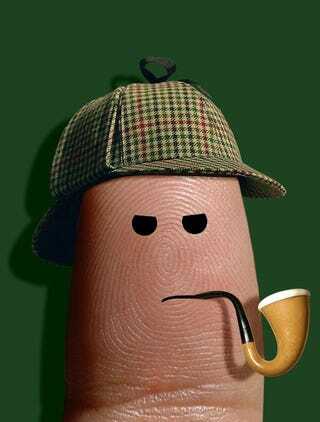 So, theres this....guy.....we'll call him Merlock Molmes, who liked to solve crimes and use cocaine. Most people who have read the books, or seen the Basil Rathborne version of him will typically picture him with a magnifying glass, looking for evidence. But, why use a magnifying glass? Well, how else are you supposed to portray someone looking for fingerprints? Fingerprints are a part of us. We're born with them and we keep them until we die. And, even though we go through several layers of skin a week, our finger prints never change. For a long time, finger prints were known to be unique. As early as 2,000 BCE, people were using finger prints to sign contracts to prevent forgery, and as far back as King Hammurabi, 1,700 BCE, finger prints were being collected off people who were arrested. By 650 CE, the Chinese had figured out that no two finger prints are alike. For the most part, however, finger prints were used to stop fraud, not for crime fighting. That's because it was so difficult to collect the evidence, as opposed to placing your print in clay, or with ink and then comparing it. In 1858, Sir William James Herschel started finger printing in India to identify english pensioners so their relatives couldn't keep collecting money after they died. He also started finger printing those who were convicted of a crime and sent to prison. In 1863, a professor at the medical school Val De Grace, Paul-Jean Coulier, discovered iodine fumes would reveal finger prints on paper. In 1879, an Argentinian police officer came up with a way to record and associate them with the current method of identifying people with photographs. He used his knowledge in 1892 to gain a confession from a murderer by proving it was her bloody thumb print found at the crime scene. In 1902, the NYPD was the first agency to base both their arrest, charges, and gained a conviction, on finger print evidence. Today, finger prints are being used more and more for things like, accessing your electronics, gaining access to a building, identifying yourself and even checking books out of a library. Not happy to let it sit with just finger prints, scientists discovered that heel prints, retina scans and even tongue prints are all unique to an individual. And in animals, nose prints are unique to the animal. So, don't be surprised if someday, you get arrested for something, and the police ask you to place your tongue on the scanner.